For someone to play international cricket for two decades is a significant procurement. To add value to such a career was the sustained entertainment provided by him. Notwithstanding what others said of him, this man had his own modus operandi on the pitch and off it as well. Whether you have or you have not guessed it, I am taking about 'Shahid Khan Afiridi'. Having announced his retirement from test cricket in 2010 and from ODIs after the ICC Cricket World Cup 2015, he was only engaged in cricket's up to the minute format. After an abortive ICC World Twenty20 2016, Afridi let go of the captaincy but expressed unfulfilled desires of continuing as a player. Consequently, Pakistan's last group match against Australia in Mohali of the 2016 event remained his last. Afridi celebrating a wicket in his signature style. In 98 T20Is (most by any player), Afridi scored 1,405 runs at an average of 18.01 and a herculean strike rate of 150.75. Apart from his highest score of 54*, the right-hand batsman has three more half-centuries to his name. As far as his leg break is concerned, Afridi has 97 wickets under his belt which came at an average of 24.35 and a strike rate of 22.1. An economy rate of 6.61 made him all the more dangerous, so much so that he is the highest wicket-taker in T20Is. He is also has the record holder of most player-of-the-match awards (11) in T20Is. Bringing the other two formats into play, Afridi ended his career with 11,185 international runs and 540 international wickets making him only the second player after Jacques Kallis to earn a combine of 10,000 international runs and 500 international wickets. 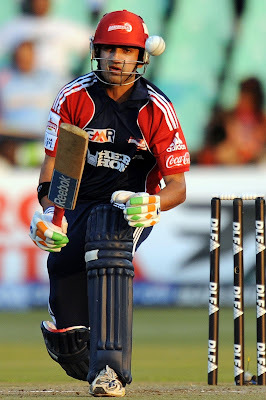 The prime highlight of his T20I career would be the semi-final and final of ICC World Twenty20 2009 wherein to go with his economical spells, he also scored 51 and 54* respectively to win the trophy for his nation. Bearing in mind the nature of T20 cricket, Afridi was someone who would perfectly fit into any playing XI around the world. A T20 contest can change it's route in a span of a couple of overs which was what Afridi was best at. Shahid Afridi in the middle, even for the shortest of while had it in him to shift the momentum to his team's side. His 'not-caring-about-the-situation' attitude worked the best for him. In high pressure affairs, where others would fear of playing the big shot, Afridi would decisively go for his shots. His strength was his strike rate and never (rightly so) did he try to compromise with it. It was this viewpoint which gave him the nickname 'BOOM BOOM Afridi'. Afridi will go down as a batsman whom the bowlers feared the most. By the look of him, you wouldn't believe that he is 36-year old. After hearing his name, one will always recall the young teenager who smashed sixes at will. Not that fans around the globe will no longer get to watch him playing. He is currently playing the Pakistan Super League for Peshawar Zalmi and has plans to continue for at least a couple of seasons. But his flamboyance will certainly be missed at the international level. So will be his gruesome sixes. So will be his crafty leg breaks. And so will be the voice of 'Well done, Shahid bhai!'. Cricket will miss it's most entertaining boy. Cricket will miss you Shahid Afridi!